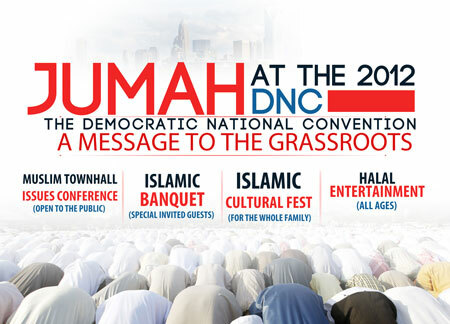 Meanwhile, the “Grand Imam” for Jumah at the DNC is none other than Siraj Wahhaj. Wahhaj is one of the most sought-after speakers on the Muslim circuit, and has addressed audiences all over the country; in 1991, he even became the first Muslim to give an invocation to the U.S. Congress. After 9/11, his renown as a moderate Muslim grew when he declared: “I now feel responsible to preach, actually to go on a jihad against extremism.” But as with so many other Muslim leaders in the U.S., Siraj Wahhaj is not as moderate as he may appear at first glance. Wahhaj was several years ago designated a “potential unindicted co-conspirator” in the 1993 World Trade Center bombing. He himself has denounced this designation as essentially meaningless, but he didn’t earn it by doing nothing. In the early 1990s he squired the Blind Sheikh, Omar Abdel Rahman, all around New York City and New Jersey, sponsoring talks by him in area mosques. The Blind Sheikh, of course, is now serving a life sentence for his role in the first World Trade Center bombing in 1993, as well as in jihad plots to blow up the Lincoln and Holland Tunnels. Issues to be covered at the convention include: Islamaphobia, Anti-Shariah, Middle Eastern Crisis, the Patriot Act, the National Defense Authorization Act and more. But I am sure they will not cover the fact that our government and military have been infiltrated by radical Islam. Or that the President’s concerns and sympathies so obviously lie with Islam, to the exclusion and persecution/dissing of Christians and especially Jews. Or that Israel is being treated like garbage by Obama and his minions and that Israel most certainly does not have our government’s support in a conflict with Iran or other radical Islamic nations. Radical terrorist plots within our borders by Muslims will also not be covered and neither will be the spread of Shariah law and its implementation in direct conflict with our Constitution. What is evident from this slobbering elevation of Islam at a political convention, is that Islam is as much a political system as it is a “religion.” This all goes to prove that radical Islam is more about power and control than it is about salvation. Each Muslim who attends is being asked to donate between $500 and $10,000. Even M. Zuhdi Jasser M.D., Founder and President of the American Islamic Forum for Democracy, has expressed serious concerns over all this. Man, if this were the movie Miracle on 34th Street and I were the attorney that had to prove that Obama was a Muslim, it would be a cakewalk. Just sayin’. The DNC is sooo immersed in their belief in multiculturalism that they have welcomed with open arms Islamic extremists that declare that America will fall unless America “accepts the Islamic agenda.” They have asserted that “if only Muslims were clever politically, they could take over the United States and replace its constitutional government with a caliphate.” It’s like those who embraced Stalin or Hitler – the DNC has embraced hate and national suicide. And they feel fine evidently. The DNC has listed the Islamists attending the DNC function as ‘typical’ of the DNC community. If that is true, then the DNC is no longer the party we knew from our parents. It is now a thoroughly subversive enemy from within and a serious threat to our nation. These same ‘typical’ Muslims declare that Islam is a militant religion and that the US will become a caliphate. Not as long as patriots breathe it won’t. The DNC has embraced radical Islam. But America hasn’t and the DNC has aligned itself with America’s enemies. We must confront the enemies from without AND within if we are to survive as a nation. While Romney and Ryan embrace the traditional roots of our country’s founding, the DNC embraces those who would conquer America. To the DNC: may the odds NEVER be in your favor again. It will be interesting to see if what Barack Obama calls “one of the prettiest sounds on earth at sunset,” the Muslim call to prayer will, ‘insha’Allah,’ end the first day of the kickoff to the Democratic National Convention (DNC) in Charlotte, NC. I would not be surprised. We, the heirs to Liberty, can only hope — God willing — that this year’s DNC will, indeed be their sunset. I could embrace that. This entry was posted in American Stuff, Authors, Constitution, History, Military, Politics, Religion, Survival, Terresa Monroe-Hamilton, Terrorism. Bookmark the permalink. Pingback: Watcher’s Council Nominations – Conventional Wisdom Edition | Virginia Right!